We had 11 members participate in the July Open Carving Session and 15 members at our July MCC Meeting. 5 new paid memberships since las month for a total of 23 paid memberships to date with 61 interested parties on our distribution list. 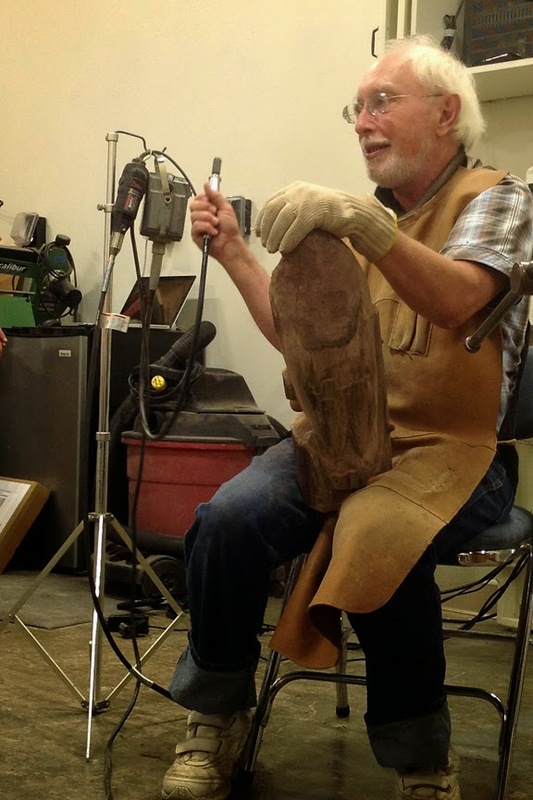 We have collect $460 in membership dues and an additional $437 dollars from our share of class fees and Robert Shaw’ s donation from the Intro To Carving Class conducted by Robert and assisted by Bert Bleckwenn. Our treasury balance is currently $897. No August meeting, but come join us at the fair. Nine members have volunteered to demo at the fair – we can always use more as we have several afternoon shifts still open! The new MCC website was announced and briefly demonstrated. An MCC Blog has also been included and is planned to be used for posting MCC Meeting “minutes”, communicating news about MCC, and possibly sharing interesting carving information. A gallery and member profile area is being tested and assessed as well. MCC business cards containing MCC’ s website and email address have been created and were handed out at the meeting and for use at the fair. Two MCC banners (one 2’x6′ and the other 2’x3′) will be ordered for use at the fair and other future public events. Several carvings were shown by members. 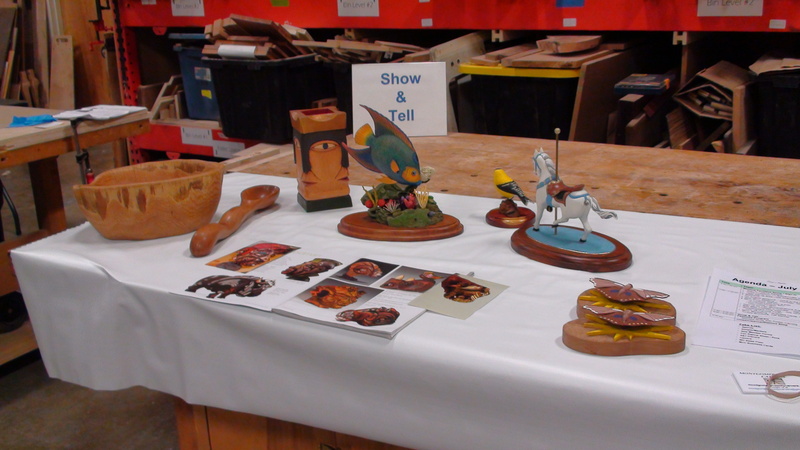 Gary Carver provided an excellent demonstration of power carving stylized birds and demonstrating different power carvers including Automach, Foredom, and Dremel units. The Automach is a reciprocating style carver while the Foredom and Dremel units utilizing flexible shafts with collets for holding a variety of burrs and small sanding drums. He standardizes on 1/8″ burrs so they are interchangeable between units and minimizes collet changes. Gary only power carves and power sands. He even uses a stainless steel tube inserted in one of his rotary units to burn in eyes for the birds. He applies four coats of polyurethane for a finish so the beauty of the grain and wood shows through. His stylized birds that tend to be 6-18″ in height take him roughly 40 hours to complete. He doesn’t let anything go to waste and makes use of small cutoffs by shaping them into stylized song birds that usually only take him a half hour to complete. Safety and dust control are high priorities for Gary. A Kevlar glove and leather apron with full neck coverage is used. It is important to use leather aprons when power carving and not cloth to avoid spinning burrs catching on the cloth. A spinning burr will just skip over leather. Gary uses dust masks, full face shields and dust collection. Gary mostly makes use of reclaimed timbers such as American chestnut and black walnut which have dramatic grain that he likes to accentuate and highlight in his carvings. Gary is also an avid supporter of the efforts to bring back the American chestnut and was past president of the Maryland chapter of the American Chestnut Foundation. Throughout the spring, summer and fall, he is regularly involved in the planting, pollination, inoculation, harvesting and general tree maintenance of several experimental chestnut groves being used to cross-pollinate the American chestnut to make a blight-resistance variety. We will all benefit if Gary and his fellow/lady volunteers are successful. If you get a chance to stop by the fair, look for our demonstration tent just across from the Old Timer’s area… we will be directly across from the blacksmiths.